“I just don’t have the time” is the number one reason I hear in response to why people aren’t exercising. Even 4 minutes four times a week will produce benefits. 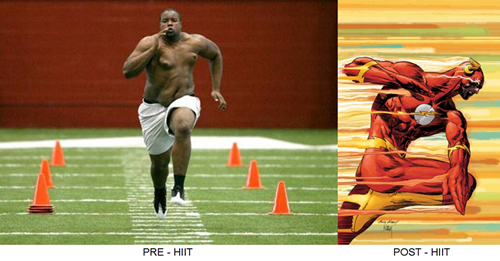 High intensity interval training, or HIIT has become a common method of working out. As the name suggests it involves alternating between periods of very intense work (0:10 – 2:00mins) and short periods of low intensity or rest (0:10-1:00min) often repeated for several rounds. HIIT is not a new concept by any means. In 1937 a Swedish cross country coach by the name of Gösta Holmér developed a method of training known as fartlek (“speed play”) because he was sick of being beaten by the Finns. He used bursts of running at a faster-than-race pace to build endurance and speed, which required athletes to use both aerobic and anaerobic energy systems. Since then many physiologists and sports coaches have employed similar methods. Another common method is Tabata training, which involves a 4-minute session of 20sec of high intensity (170%) followed by 10sec of absolute rest, for a total of 8 rounds. Decreased risk of CVD (cardiovascular disease): Better heart health! Increased fat loss and energy expenditure, increasing post-workout fat oxidation: Boosts metabolism, continue to burn calories up to 24hrs after working out.